I’m told the Golden Gate Bridge is painted continuously – crews start at one end and when they reach the other they start over. I do the same thing with my house, but I’m guessing the bridge crew is a lot faster. If I may say so myself, the bedroom turned out great – warm, tidy and inviting. But we all know what happens once you paint one room. Suddenly the rest of the house looks like a public works building that hasn’t been updated since the Reagan administration. So I decided to keep going until I’d updated the whole house. Not a bad prospect. I love painting. It’s instant gratification. Slap on a little liquid happiness and the scuffs, scratches and scars instantly disappear. But there is a downside. It’s become clear over the years that I’m hopeless at choosing paint. 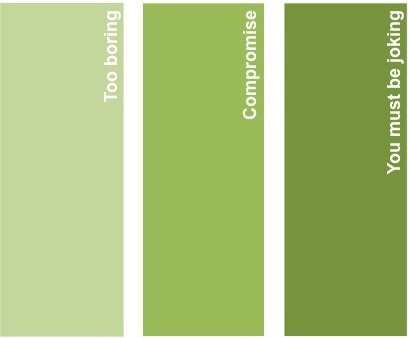 After test-painting a wall a dark green color, I remarked to my then-toddler, “I think I really hate this color.” He replied, “I hate it, too.” Better taste than I, and still in diapers. I recently got a can of paint free because the color I chose was so hard to mix they finally just gave up and gave it to me for nothing. On this go-round, I’ve decided to use one of the pre-selected color palettes designed specifically for hopeless painters. I now feel pressure to paint everything in the house before the manufacturer obsoletes the color palette. Nothing worse than a renovation that’s already out of style. So I’ve become a regular at the paint store. I even have a frequent buyer’s discount that I got pretty much just for walking in. There are cans of paint everywhere, some still unopened. Somehow, I need to keep up my motivation. Maybe I could start a support group for obsessive painters. (The first invitation will go to a dear friend who confessed her bedroom is about two inches narrower than it used to be because she’s painted it so many times.) Anyone want to join in? You can bring your folder full of paint chips to the next meeting. This entry was posted in Family life, Household management and tagged home decor, home renovation, humor, paint, paint chips, painting by Sarah Day. Bookmark the permalink. LOL I love to paint. I used to do this a lot when I was still with a theater company and worked in productions, I would claim ownership of any panting job. It relaxes me. I just hope that we will be allowed to paint this rented apartment that we are staying now because the color is absolutely hideous! It relaxes me too, strangely, so much so that I get almost nothing else done if I’m painting. That is why I go with white. Painted by professionals, not myself. My only attempt to paint myself showed again why I consider myself an intellectual rather than a do-it-yourself goddess. (Ended up painting in my underwear, because the ceiling paint was dripping on my clothing and I figured I would definitely be able to shower it off, but skeptical about the laundry turning out ok). Painting ceilings is the worst. As much as I enjoy painting WALLS I would rather live with water stains and ceiling cracks than paint ceilings. My husband and I painted our kitchen recently. Hard work, mostly because it involved a ladder considering the high ceiling walls (we did not paint the ceiling itself), but so very rewarding. Once done, we stood there and marveled. Relaxing indeed. We have a very high entryway and when I last painted it I swore I would never do it again – I was painting after the kids went to bed with my husband out of town and I realized if I fell off the ladder no one would find me until morning! If only we owned our house! I dream of painting. Due to my husband’s job we never stay anywhere long enough to own. I’m crossing my fingers that this time will be different. I want to paint! Maybe I’ll come over and get my paint fix at your house! Hello, thanks for visiting! It seems we need an auxiliary support group for people who want to paint but can’t. Maybe a service to match up those who have painting projects with those who need painting projects?